Strip Mode so it would be superior in the said race type. The straight-line has a long history to boot, to the point that the first cars used in drag races date back to the history of the automobile itself. It's inevitable, as human beings are hard-wired to love racing. In the 1960s, recording race results via electronic timing and speed sensing systems started to become a thing. You know what else became a thing during that decade? Indoor drag races. Apparently, there was International Amphitheatre in Chicago, Illinois, that was a home to the petrol-heads of that era, orchestrating straight-line races between several hundreds of attendees. It was built in 1934 but was demolished in 1999. The amphitheater was actually intended to host many things other than indoor racing. Concerts, circuses, and exhibitions were the common happenings, but nothing beats the peculiarity of indoor drag races that racing promoter Bill Schade started. Just imagine the smell of smoke and burnt rubber within the area, as well as the sound that echoes in the enclosed auditorium. ⠀ Can Tesla Model X Beat Lamborghini Aventador S On A Drag Strip? Schade worked with the United States Auto Club (USAC) in making the indoor drag races happen. 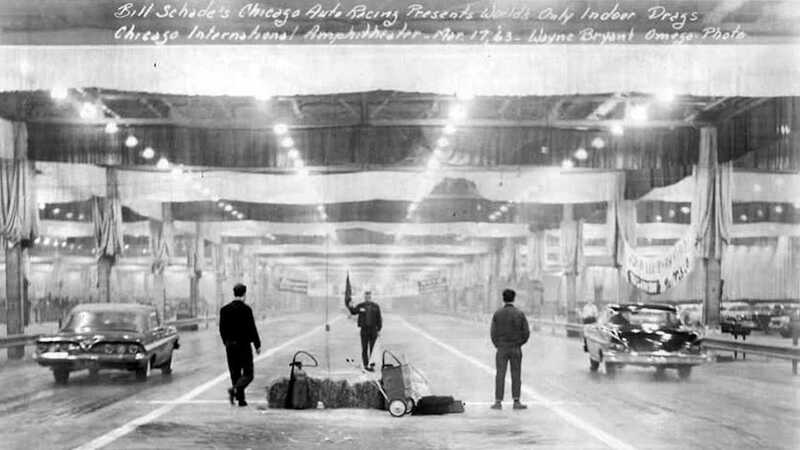 It was meant to shield the racers through the chilly months of Chicago's winter, with the first-ever indoor drag race was held on December 30, 1962. It was a short track, though, as the 440-foot stretch of concrete within the auditorium served as tarmac for the gasoline-burning muscle cars at that time. The lanes were 60-foot wide, guarded by steel rails. The first race was a success, giving birth to a second race that happened on January 5, 1964. However, that would be the last indoor drag race at the International Amphitheatre, without any solid explanation why.